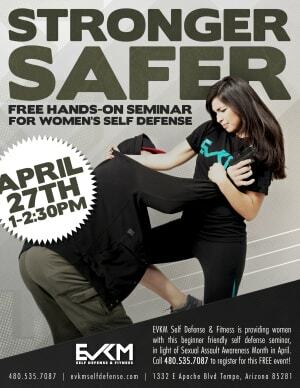 April is Sexual Assault Awareness Month (SAAM) and to help raise awareness and education, EVKM Self Defense & Fitness will be hosting a Women's Krav Maga Seminar on Saturday, April 27th. This seminar will be held from 1pm - 2:30pm at EVKM's facility in Tempe (1332 E Apache Blvd) and will teach women some vital fundamentals of self-defense with some of the top techniques, tactics, and strategies every woman should know. Lead by some of the female Krav Maga instructors of EVKM, this special seminar event is open to the public, all skills levels welcome and being held at no cost to attendees! For women ages 13+ only. Visit this link to register!